For other people named Charles Edward Stuart, see Charles Edward Stuart (disambiguation). "Bonnie Prince Charlie" redirects here. For other uses, see Bonnie Prince Charlie (disambiguation). Charles Edward Louis John Casimir Sylvester Severino Maria Stuart (31 December 1720 – 31 January 1788) was the elder son of James Francis Edward Stuart, grandson of James II and VII and after 1766 the Stuart claimant to the throne of Great Britain. 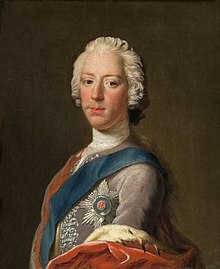 During his lifetime, he was also known as "The Young Pretender" or "The Young Chevalier" and in popular memory as "Bonnie Prince Charlie". He is best remembered for his role in the 1745 rising; his defeat at Culloden in April 1746 effectively ended the Stuart cause, and subsequent attempts (such as a planned French invasion in 1759) failed to materialise. His escape from Scotland after the uprising led him to be portrayed as a romantic figure of heroic failure in later representations. Charles was born in the Palazzo Muti, Rome, Italy, on 31 December 1720, where his father had been given a residence by Pope Clement XI. He spent almost all his childhood in Rome and Bologna. He was the son of the Old Pretender, James, son of the exiled Stuart King James II and VII, and Maria Clementina Sobieska, the granddaughter of John III Sobieski, most famous for the victory over the Ottoman Turks in the 1683 Battle of Vienna. He had a privileged childhood in Rome, where he was brought up Catholic in a loving but argumentative family. As the legitimate heirs to the thrones of England, Scotland, and Ireland—according to the Jacobite succession—his family lived with a sense of pride, and staunchly believed in the divine right of kings. His grandfather, James II of England, Ireland and VII of Scotland, ruled the countries from 1685 to 1688. He was deposed when Parliament invited the Dutch Protestant William III and his wife Princess Mary, King James' eldest daughter, to replace him in the Revolution of 1688. Many Protestants, including a number of prominent parliamentarians, had been worried that King James aimed to return England to the Catholic fold. Since the exile of James, the "Jacobite Cause" had striven to return the Stuarts to the thrones of England and Scotland, which were united in 1603 under James VI and I, with the parliaments joined by the Acts of Union in 1707 as the United Kingdom of Great Britain. Charles Edward played a major part in the pursuit of this goal. In 1734, Charles Edward observed the French and Spanish siege of Gaeta, his first exposure to war. His father managed to obtain the renewed support of the French government in 1744, whereupon Charles Edward travelled to France with the sole purpose of commanding a French army that he would lead in an invasion of England. The invasion never materialised, as the invasion fleet was scattered by a storm. By the time the fleet regrouped, the British fleet realised the diversion that had deceived them and resumed their position in the Channel. Undeterred, Charles Edward was determined to continue his quest for the restoration of the Stuarts. In December 1743, Charles's father named him Prince Regent, giving him authority to act in his name. Eighteen months later, he led a French-backed rebellion intended to place his father on the thrones of England and Scotland. Charles raised funds to fit out two ships: the Elisabeth, an old man-of-war of 66 guns, and the Du Teillay (sometimes called Doutelle), a 16-gun privateer, which successfully landed him and seven companions at Eriskay on 23 July 1745. Charles had hoped for support from a French fleet, but it was badly damaged by storms, and he was left to raise an army in Scotland. The Jacobite cause was still supported by many Highland clans, both Catholic and Protestant. Charles hoped for a warm welcome from these clans to start an insurgency by Jacobites throughout Britain. He raised his father's standard at Glenfinnan and gathered a force large enough to enable him to march on Edinburgh. The city, under the control of the Lord Provost Archibald Stewart, quickly surrendered. 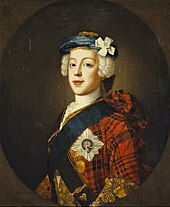 While he was in Edinburgh a portrait of Charles was painted by the artist Allan Ramsay, which survives in the collection of the Earl of Wemyss at Gosford House. On 21 September 1745, he defeated the only government army in Scotland at the Battle of Prestonpans. The government army was led by General Sir John Cope, and their disastrous defence against the Jacobites is immortalised in the song "Johnnie Cope". By November, Charles was marching south at the head of approximately 6,000 men. Having taken Carlisle, his army progressed as far as Swarkestone Bridge in Derbyshire. Here, despite Charles' objections, his council decided to return to Scotland, given the lack of English and French support and rumours that large government forces were being amassed. 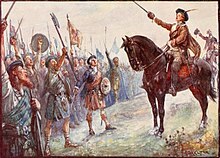 The Jacobites marched north once more, winning the Battle of Falkirk Muir, but were later pursued by King George II's son, the Duke of Cumberland, who caught up with them at the Battle of Culloden on 16 April 1746. Ignoring the advice of one of his generals, Lord George Murray, Charles chose to fight on flat, open, marshy ground where his forces would be exposed to superior government firepower. Charles commanded his army from a position behind his lines, where he could not see what was happening. Hoping Cumberland's army would attack first, he had his men stand exposed to the British Royal artillery. Seeing the error in this, he quickly ordered an attack, but his messenger was killed before the order could be delivered. The Jacobite attack, charging into withering musket fire, and grapeshot fired from the cannons, was uncoordinated and met with little success. The Jacobites broke through the bayonets of the redcoats in one place, but they were shot down by a second line of soldiers, and the survivors fled. Cumberland's troops were claimed to have committed a number of atrocities as they hunted for the defeated Jacobite soldiers, earning him the title "the Butcher" from the Highlanders. Murray managed to lead a group of Jacobites to Ruthven, intending to continue the fight. Believing himself betrayed, however, Charles had decided to abandon the Jacobite cause. During the campaign, James, the Chevalier de Johnstone, acted as Aide de Camp for Murray and, briefly, for Charles himself. James provided a first-hand account of these events in his "Memoir of the Rebellion 1745–1746". Charles's subsequent flight has become the stuff of legend and is commemorated in the popular folk song "The Skye Boat Song" (lyrics 1884, tune traditional) and the old Irish song "Mo Ghile Mear" by Seán Clárach Mac Domhnaill. Hiding in the moors of Scotland, he was always barely ahead of the government forces. Though many Highlanders saw Charles, and indeed aided him, none of them betrayed him for the £30,000 reward offered. Charles was assisted by supporters such as the pilot Donald Macleod of Galtrigill, Captain Con O'Neill, second son of Captain Con Modera O'Neill of the O'Neills of the Feevagh, who brought the Prince to Benbecula and Flora MacDonald, whom he had met previously at the home of their mutual relative Ambrose O'Neill of Ballybollan in the county of Antrim, who helped him escape to the Isle of Skye by taking him, disguised as her Irish maid, "Betty Burke", in a small boat. In this way he evaded capture and left the country aboard the French frigate L'Heureux, arriving back in France in September. The Prince's Cairn marks the traditional spot on the shores of Loch nan Uamh in Lochaber from which he made his final departure from Scotland. With the Jacobite cause lost, Charles spent the remainder of his life—except for one brief, secret visit to London—on the continent. While back in France, Charles had numerous affairs; the one with his first cousin Marie Louise de La Tour d'Auvergne, wife of Jules, Prince of Guéméné, resulted in a short-lived son Charles (1748–1749). In 1748 Charles was expelled from France under the terms of the Treaty of Aix-la-Chapelle which brought the war between Britain and France to an end. Charles lived for several years in exile with his Scottish mistress, Clementina Walkinshaw, whom he met, and may have begun a relationship with, during the 1745 rebellion. In 1753, the couple had a daughter, Charlotte. Charles's inability to cope with the collapse of the cause led to his problem with drink, and mother and daughter left Charles with his father James's connivance. Charlotte went on to have three illegitimate children with Ferdinand, an ecclesiastical member of the Rohan family. Their only son was Charles Edward Stuart, Count Roehenstart. Clementina was suspected by many of Charles's supporters of being a spy planted by the Hanoverian government of Great Britain. After his defeat, Charles indicated to the remaining supporters of the Jacobite cause in England that, accepting the impossibility of his recovering the English and Scots crowns while he remained a Roman Catholic, he was willing to commit himself to reigning as a Protestant. Accordingly, he visited London incognito in 1750 and conformed to the Protestant faith by receiving Anglican communion, likely at one of the remaining non-juring chapels. Bishop Robert Gordon, a staunch Jacobite whose house in Theobald's Row was one of Charles's safe-houses for the visit, is the most likely to have celebrated the communion, and a chapel in Gray's Inn was suggested as the venue as early as 1788 [Gentleman's Magazine, 1788]. This rebutted David Hume's suggestion that it was a church in the Strand. Unusually, the news of this conversion was not advertised widely, and Charles had seemingly returned to the Roman Catholic faith by the time of his marriage. In 1759, at the height of the Seven Years' War, Charles was summoned to a meeting in Paris with the French foreign minister, the Duc De Choiseul. Charles failed to make a good impression, being argumentative and idealistic in his expectations. Choiseul was planning a full-scale invasion of England, involving upwards of 100,000 men—to which he hoped to add a number of Jacobites led by Charles. However, he was so little impressed with Charles, he dismissed the prospect of Jacobite assistance. The French invasion, which was Charles's last realistic chance to recover the British throne for the Stuart dynasty, was ultimately thwarted by naval defeats at Quiberon Bay and Lagos. In 1766, Charles's father died. Pope Clement XIII had recognised James as King of England, Scotland, and Ireland as "James III and VIII" but did not give Charles the same recognition. In 1772 Charles married Princess Louise of Stolberg-Gedern. They lived first in Rome and in 1774 moved to Florence, where in 1777 he purchased for his residence the Palazzo di San Clemente, now known also in his memory as the Palazzo del Pretendente. In Florence he began to use the title "Count of Albany" as an alias. This title is frequently used for him in European publications; his wife Louise is almost always called "Countess of Albany". In 1780, Louise left Charles. She claimed that Charles had physically abused her; this claim was generally believed by contemporaries even though Louise was already involved in an adulterous relationship with the Italian poet Count Vittorio Alfieri. In 1783, Charles signed an act of legitimation for his illegitimate daughter Charlotte, born in 1753 to Clementina Walkinshaw (later known as Countess von Alberstrof). Charles also gave Charlotte the title "Duchess of Albany" in the peerage of Scotland and the style "Her Royal Highness", but these honours did not give Charlotte any right of succession to the throne. Charlotte lived with her father in Florence and Rome for the next five years. The claims by two 19th-century charlatans, John Carter and Charles Manning Allen alias John Sobieski Stuart and Charles Edward Stuart, that their father, Thomas Allen, was a legitimate son of Charles and Louise are without foundation. Charles died in Rome of a stroke on 31 January 1788, aged 67. He was first buried in the Frascati Cathedral, where his brother Henry Benedict Stuart was bishop. At Henry's death in 1807, Charles's remains (except his heart) were moved to the crypt of St. Peter's Basilica in the Vatican where they were laid to rest next to those of his brother and his father near the monument to the Royal Stuarts. His mother is also buried in St. Peter's Basilica. His heart remained in Frascati Cathedral, where it is contained in a small urn beneath the floor under a monument. 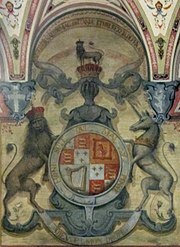 During his pretence as Prince of Wales, Charles claimed a coat of arms consisting of those of the kingdom, differenced by a label argent of three points. "Óró sé do bheatha abhaile"
^ Additional Manuscripts, British Library, 30,090, quoted in Frank McLynn, Charles Edward Stuart: A Tragedy in Many Acts (London: Routledge, 1988), 8. ^ a b "Charles Edward Stuart – Jacobites, Enlightenment and the Clearances – Scotland's History". Archived from the original on 10 November 2015. ^ "Lost Bonnie Prince Charlie portrait found in Scotland". BBC News. 22 February 2014. Archived from the original on 21 February 2014. Retrieved 23 February 2014. ^ Burke, Sir Bernard. A Selection of Arms Authorised by the Laws of Heraldry. p. 113. ^ "Charles Edward Stewart: The Young Pretender". The Scotsman. UK. Archived from the original on 25 November 2007. Retrieved 5 May 2010. ^ Mayne, Ethel Colburn (6 May 1909). Enchanters of Men (Second ed.). London: Methuen & Co. p. 206. Retrieved 28 May 2016. ^ Anonymous. "Bonnie Prince Charlie". History.co.uk. Archived from the original on 18 November 2015. Retrieved 18 November 2015. ^ Francois R. Velde. "Marks of Cadency in the British Royal Family". Heraldica.org. Archived from the original on 13 March 2017. Retrieved 5 May 2010. Chidsey, Donald Barr. 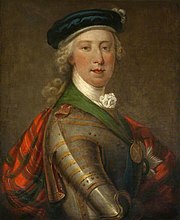 Bonnie Prince Charlie. London: Williams & Norgate, 1928. Daiches, David. Charles Edward Stuart: The Life and Times of Bonnie Prince Charlie. London: Thames & Hudson, 1973. Douglas, Hugh. 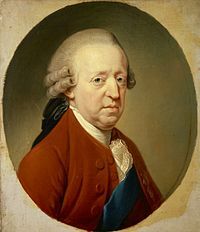 Charles Edward Stuart. London: Hale, 1975. Kybett, Susan M. Bonnie Prince Charlie: A Biography of Charles Edward Stuart. New York: Dodd, Mead, 1988. McLynn, Frank. Charles Edward Stuart: A Tragedy in Many Acts. London: Routledge, 1988. McLynn, Frank. The Jacobites. London: Routledge & Kegan Paul, 1985. Longmate, Norman. Island Fortress: The Defence of Great Britain, 1603–1945. Harper Collins, 1993. The Jacobite Rebellion, BBC Radio 4 discussion with Murray Pittock, Stana Nenadic & Allan Macinnes (In Our Time, May 8, 2003).